If you haven’t discovered the joys of staying dry when you’re boating in colder weather and water, you’re in for a treat. Modern technical fabrics that block water from soaking through while allowing your perspiration to exit make for comfortable boating. However, the fabric alone doesn’t keep you dry. 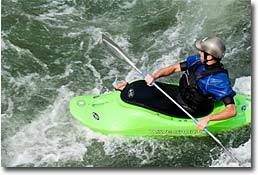 Whether it’s a drytop, dry pants or a full drysuit, there also has to be something at the openings to keep water out. 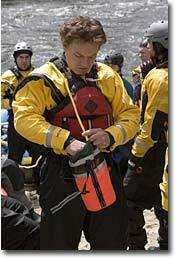 Drysuits have waterproof entry and relief zippers. The other openings, at neck, wrists and ankles, have to have some type of gasket to make the seal. For the driest seal, you can’t beat latex gaskets. 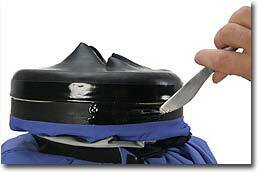 The sturdy, flexible latex material forms a great watertight barrier. Our latex gaskets and socks are made from the highest quality natural rubber latex. This natural latex is formed from the milky sap of the Para Rubber Tree (Hevea brasiliensis). Natural rubber latex is the best choice for gaskets. The manufacturing process makes a seamless product with an even thickness that’s also smooth and soft against the skin. It has very good tensile strength and is tear, puncture and abrasion-resistant. Some boaters prefer neoprene gaskets, such as the ones we use in our semi-dry wear. Neoprene is even stretchier than latex, which makes these gaskets inherently more comfortable against the skin. However, this extra stretch keeps them from being as dry as latex ones (hence our referring to these garments as “semi-dry”). Nevertheless, for many boaters they are plenty dry enough for their type of boating. To protect either type of gasket, keep sharp objects away from them. Rings, ear rings and watch bands can cause a tear; remove them when donning or removing gaskets. After wearing a garment with latex gaskets, rinse them thoroughly with clean, salt-free water, dry the gaskets with towels and coat them with 303 Aerospace Protectant. The neoprene gaskets have fabric on the outside, which protects them from sunlight. On NRS tops the neoprene is covered on the inside with a GlideSkin™ coating, which should also be rinsed and dried after use, and will benefit from a coat of 303. Store gaskets in a cool place away from light, either sun or artificial light. Keep oils, greases and solvents away from the gaskets. Avoid getting sunscreen products on your latex gaskets since these products are harmful to latex. First time wearers of drywear sometimes find latex gaskets, especially neck gaskets, tight and uncomfortable. In most cases, the gaskets stretch naturally and you get used to the snug fit. You can speed up that relaxing of the latex by stretching the gasket over a round object, like a coffee can, that is slightly larger than your neck. Leave it over the object for two-three days and you should find a more comfortable fit. Some folks still find the gasket too tight and want to trim it to a wider opening. Proceed with caution! An improper cut can cause a split and tear in the gasket. If you must cut a latex gasket, stretch it over a round object and use a very sharp blade, like an exacto knife to make the cut. Cut between two of the ridges on the gasket creating a smooth line parallel to the ridges. Remember, even a downward nick will cause a tear. Note: Gaskets are not covered under warranty. We get the gaskets to you in good condition. How they are used and taken care of is up to you and out of our control. Latex gaskets are tough and durable. However, there is a good likelihood that at some time during the life of a drywear garment, you’ll have to replace one or more of the gaskets. One of the illustrations on our do-it-yourself gasket repair page. We do offer the service of replacing your latex gaskets. Check out our NRS Repair page for prices and procedures. Replacing a gasket isn’t rocket science. We sell replacement gaskets and the adhesive Aquaseal and Cotol Accelerator and Cleaner for doing it yourself. The gasket repair kits come with enough Aquaseal and Cotol to do the repair. Once you discover the joys of drywear, you’re in for extended boating seasons and dry, warm comfort. And gaskets are wonderful items that help make it all possible!